It’s incredibly challenging for many of us to maintain a positive body image when we live in a world of shiny Instagram filters and images of people “living my best life”. Ugh. Ideally I would wrench you all away from Instagram but if you insist on staying, may I suggest you become discerning about who you are following? Does that fitspo account actually inspire you into wanting chia seeds for breakfast, or does it leave you feeling dissatisfied and defeated? Instagram works on algorithms, which means it simply feeds you more of what you are already following. If you want to feel better about yourself, why not consider following accounts whose specific aim is to make you feel better about yourself? So I’ve done some of the hard work for you! See below for a list of accounts committed to helping you realise you are already enough. Just as you are. And some hash tags to follow…. Tickets now on sale for CPD workshop on Saturday 26th January 2019. 20 minute Skype session with me before the course starts. This will be an opportunity for you to find out exactly what you are signing up for and to make sure this course is for you. 8 x 90 minute group sessions where we will learn why diets create a really unhelpful relationship with food and led to MORE overeating. Opportunities to share and learn from each other, as well as supporting one another. Exercises you can used to help you on this intuitive eating journey. Support between sessions, with group chat available. Research shows that social support is helpful when it comes to motivation and making changes. For more information, please register your interest via the contact page and I will get in touch to discuss. If loving our bodies is too much to ask, can we just give a little respect? We hear again and again that we should love our bodies but how do we even begin to do this? For many of my clients, accepting or loving their bodies feels impossible. 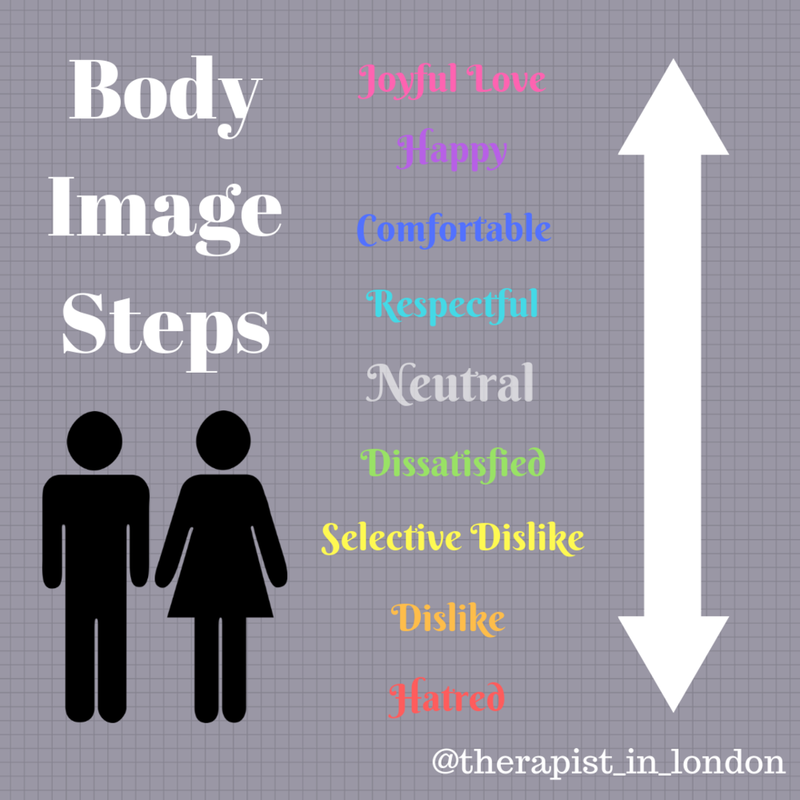 That can be pretty disheartening, so I developed the body image steps to help my clients figure out how to feel a bit more comfortable (or a bit less uncomfortable!) in their bodies. Body acceptance, positive body image or whatever you want to call it, is rarely a linear process. We may move up and down the steps in the space of a day, or even one meal! Sometimes people say to me that body acceptance feels like giving up. To them I say yes, it is giving up. .
*It’s giving up on self hatred. *It’s giving up on defining your self worth by your body shape. *It’s giving up on trying to force your body into the unrealistic ideal portrayed by the media. *It’s giving up on ignoring your body’s signals. *It’s giving up on obsession, dieting and all the misery that comes with it. Where are you on the scale today and what are you willing to give up to move onto the next step towards sanity around food and your body?